Here’s the deal, y'all. I like to try new things. I like to save money. So any time I can combine the two, I jump at the chance. I am the kind of person who will spend $300 to bleach and color my hair, but I refuse to spend $25 on a haircut. There was one time I tried to cut my own hair in first grade, and all I remember is deciding to chop off a section of my hair, and then giving it to my mom as a gift (LOL). Needless to say, she did not like the gift, and I was forever scared of touching my own head with a pair of scissors again...until recently, when I decided to try cutting my hair again. Unfortunately, an almost-finished journalism degree and a few hundred hours of watching beauty vlogs did not properly train me to be able to call this attempt a complete success. So, I am here to share with you all of my mistakes, that way you don’t have to make the same ones. For some reason, I thought that if I watched one tutorial from a girl with thick hair down to her waist, that it would teach me to trim my shoulder length and practically invisible thin hair. The first lesson for any kind of attempt to do permanent change to your body should be: RESEARCH. Do more than just Googling a few tips and tricks. Look up specifics for your hair type and length. Make sure you know the proper way to hold your hair and section it off, too. LOL guys, this is when I realized this attempt would be more of a fail than anything else. I grabbed trusty scissors that I'd been using to cut open plastic wrappers, boxed packages and sometimes even food – thinking it would be fine to cut my ends with the same tool. I could tell something was off right away, because they weren't slicing my hair as easily as you'd imagine. Not only was it a struggle, but it probably wasn't the safest or healthiest idea to use these on my hair. 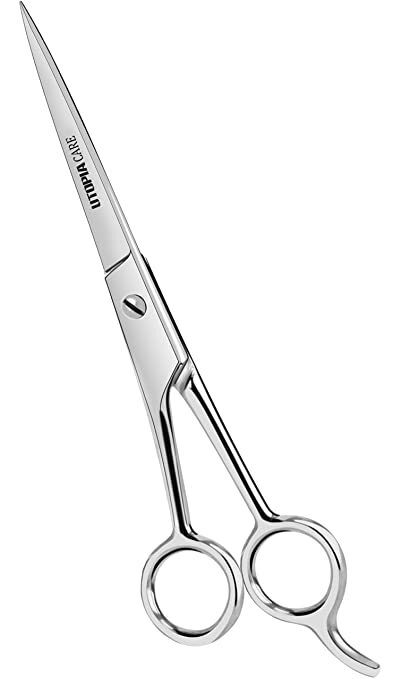 You can find the right type of hair-cutting shears on Amazon for less than $10, and if you plan to keep up with caring for your hair on your own, it's definitely a great investment. Don’t attempt cutting the back of your hair. So this might be obvious, but you should only trim the parts of your hair that are super easy to see. I would suggest only trimming the really dry ends because those tend to fall off eventually from breakage. Unless you’ve had a ton of practice or you’ve been well-trained, it can be easy to think you’re cutting a clean line until – you brush your hair out and realize one side is hanging a bit lower than the other. Make sure you section your hair off as well. You may not think you've left your 'do in layers, but you will when your roommate takes a picture of your hair from the back. Maybe just go to a professional. All in all, being able to trim your hair is probably a good life skill to have. If you can keep your hair healthy without needing to go to your hairstylist to cut two inches, you have truly achieved a certain level of greatness. Sadly, if you’re like me and are more likely to cut your side-bangs a bit too short, I’d say to just save the snipping for the pros.